For our 44th Season we are focusing our Education Program on Keepin’ it Real, a youth-centered arts integration program which includes in-class work, developing Social & Emotional Learning and performance. 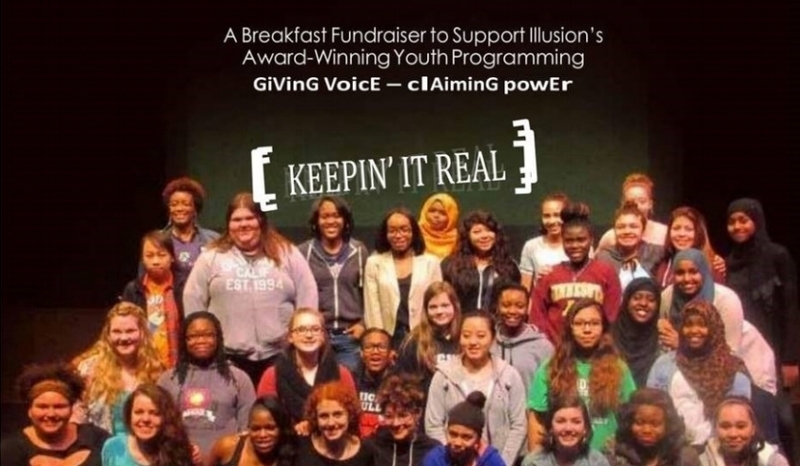 Illusion created this program with high school students to prepare younger students for the transition to high school. All the frankness, fun and failure that happens in high school comes out in this interactive performance piece built from stories of older teens who tell their truths to younger teens—so the new teens entering high school can avoid some of the pitfalls the older students experienced. Over the course of the performance, the teen audience gets to interact and discuss how they would act if they were in the situation, actually practicing skills that can be useful in dealing with internet bullying, upper male classmen hitting on freshmen women, cliques of mean girls, and peer pressure around alcohol and drug use. It has been seen by over 2,000 teens in the past two years. “This play helped me understand situations more in life. It also helped me realize the different right and wrong paths to take in situations. Illusion’s approach in KEEPIN’ IT REAL works within the classroom to help students improve academically, as well as socially/emotionally in the five key Social Emotional Learning areas as recognized in the 2013 CASEL Guide: Effective Social and Emotional Learning Programs, 1) self-management, 2) self-awareness, 3) responsible decision-making, 4) relationship skills, and 5) social awareness. KIR also provides 8th graders the opportunity to address the challenges of being ready for high school in a unique and meaningful way. appeared in local and national television commercials, feature films (including: The Cure, Justice, Crossing the Bridge, Wooley Boys) HBO mini-series (Laurel Avenue, Equinox), and other television programming. T. Mychael had the great honor of singing the National Anthem for both President Barak Obama and President Jimmy Carter. About illusion Theater: Producing Directors Bonnie Morris & Michael Robins have used the power of theater to catalyze personal and social change, illuminating the illusions, myths and realities of our times. In 40 years, Illusion has generated over 500 plays, developed thousands of artists, and created ground-breaking educational works. Plays developed at Illusion have been produced in theaters throughout the world. Illusion’s work has catalyzed conversations in living rooms, kitchens, coffee houses and board rooms, and has led to transformations in policy, in organizations, in students and in individuals. Illusion’s Education work has won numerous awards and has been experienced by millions of students in over 40 states and in 80% of Minnesota counties.